These buildings are where so much magic happens. A few weeks ago, my friend and Avon Walk teammate Shelby, a researcher at Genentech, asked me if I'd like her to try to arrange a meeting with some of the trailblazers in the Her-2+ research field while I'd be in town. "YES, PLEASE!" I think I wrote back immediately. Shelby orchestrated that meeting, and it was one of the most memorable experiences of my life. Last Friday afternoon, my friend (and another teammate) Ginelle and I drove down to the Genentech campus, arriving nearly 45 minutes early because I was so geeky excited about what was about to happen. One of the researchers is a guy Shelby met through Genentech's onsite daycare. His son is in class with her children, and when she found out he was on the development team for Kadcyla (the drug I've been on since last May), she might have told him my entire story and thanked him profusely and wept a bit. Which is pretty much how I reacted when I met him last week. I was so in awe of this guy, who is around my age, who has a 2-year-old son and was so amicable and open about his research and proud to show off his lab and just amazingly COOL as I stood there trying to think of just one of the million questions I had for him while also holding back tears. He told me his dad died of cancer at just 50 years old. He told me he's known as "the combination man." He plays with molecular combinations and tests them against breast cancer cells, most of them Her-2+ like mine were. He was a member of the small team that piggybacked a potent, bomb-like, extremely toxic chemo drug to Herceptin and got it to work, to deliver this bomb inside cancer cells that over-express the Her-2 protein without destroying the cells around them. He continues to play with combinations that will kill cancer more effectively and with less toxicity to the patient. The other scientist I met is a true pioneer. When she came walking down the hall about twenty minutes into my conversation with the combination man, I could no longer hold back my tears. I don't remember if I hugged her. I was trying to maintain some composure. She's been at Genentech most of my life, researching tirelessly (and also raising three kids). She was one of the primary developers of Herceptin, an antibody that binds to the Her-2 protein, signals those cancer cells to stop dividing, and tells the immune system to destroy them. 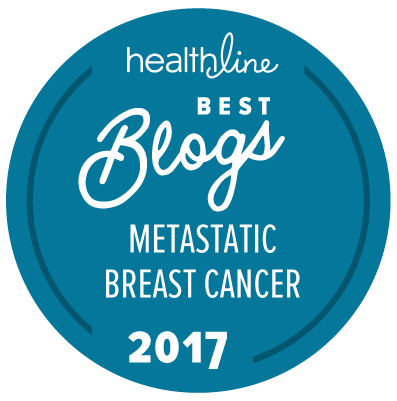 Hands down, Herceptin has been one of the most important developments in treating breast cancer. She said it has been the best thing she's done in her life. I asked what was on the horizon because I'm always hoping to hear about the next big breakthrough, although I also understood that they couldn't go into too many specifics for so many reasons. They told me they're investigating what causes resistance to treatment. They're evaluating other drug combinations (a Kadcyla/Perjeta clinical trial is already underway). They're translating their successes with breast cancer therapies to other cancers. They're collaborating with researchers outside the U.S. They're working with regulators to speed things up where it might be possible. They're energetic and enthusiastic and dedicated to their work. They're also scientists, and realists, and fully understand the wiliness of the beast they're up against. I can't thank them enough for their help in slaying it. I hope they--and I--can continue killing cancer for many, many years to come. Wow. As a fellow HER2+, I teared up just reading your post. I probably wouldn't have been able to stop my tears if I were to visit there. So thankful for all the people working to end cancer. Thank you for sharing about your visit. It was such an eye-opening, humbling, inspiring visit. Day in and day out, these people are developing molecules aimed at one thing: killing cancer. It was such an honor to meet them. That's so wonderful that you got to meet her! I would have cried too. I know some really great people. My friend Shelby, who set up this meeting, is no exception. I am so lucky for that.